Short-Term Diet or Long-Term Lifestyle Change? Being a mindful and conscious consumer can be hard sometimes. There are incredible, affordable options out there for everything from shampoo to t-shirts that align with my beliefs (ethically made, useful, non-toxic) but I sometimes find myself lusting after gorgeous brand-name grocery items/purses/lipsticks/yoga pants. I might get pretty far down the road towards purchase or consumption before I “catch” myself and am reminded think more deeply. So I started thinking: What am I really doing here, a diet where I can have “cheat days” or a lifestyle change where I am 100% committed and compromise only when absolutely necessary? The short answer is: I might currently be on a “diet” but I hope it morphs into long-term habits. No one is perfect but as long as I am being conscious of my choices and give myself a break if I stray on occasion, I’ll consider it a “win.” An article I like to remind myself of is this one about where we all draw the line. I think my line is more wiggly/faint right now than I’d like, but I know it’s more clear than it used to be. And I know that if I continue on my current trajectory, it will only get stronger. 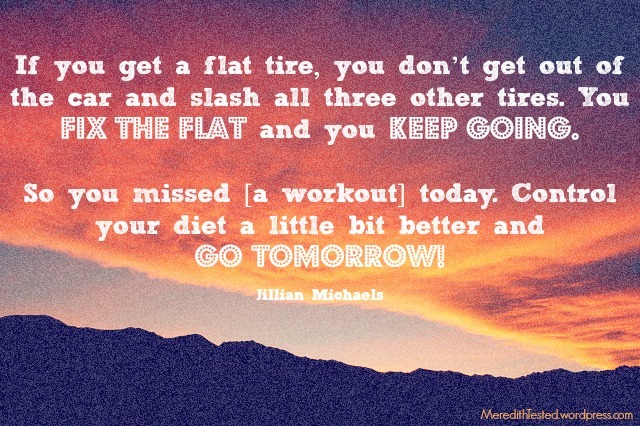 This quote is about working out but I think it applies to much more. Just because you experience a set back doesn’t mean you should throw in the towel. Get back on the horse, lift yourself up, (insert whatever metaphor you like here … something about baseball, perhaps? ), realign yourself with your goals and start again. Where do you “draw the line?” Do you give yourself a break for mistakes or strays?